Remove stucco on ceiling using a spray bottle with water; use a spatula to remove wet stucco to the approximate diameter of the ceiling medallion. Apply ceiling center to the ceiling making sure that the hole for the fixture is perfectly centered. In order to hold the ceiling medallion in place while the adhesive dries, use a couple of small nails around the edge. In the case of large ceiling medallions use four or more drywall screws. Simple cover with dap caulking afterwards. 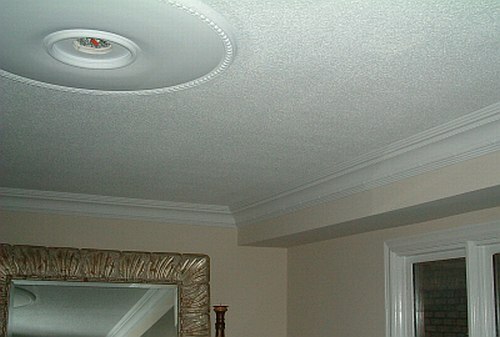 Apply a small bead of paintable latex caulking around the edge of ceiling medallion in order to seal it and to cover any gaps. Re-install the light fixture. You may need a slightly longer center screw to re-install the fixture because of the added height of the ceiling medallion.